I used: CG Lemon Fizz, Essie Mint Candy Apple, CG White Out, OPI A Shorts Story, Finger Paints Leonardo Da Vin-Pink & Essie Mesmorize. Simple and fun! I even clipped down my nails again - just a smidge. I am really enjoying shorter nails.. For now!! I hope everyone has had a great start to November!! Freshie - He is very adorable! I am glad that they do seem to get along as they are both alone all the time! I let them be together for a few minutes every few days - seems to keep them happy!! Zara - Thankies! I agree!! JQ - I figure I might as well be honest.. Not everything I do is photo-worthy, but I figure I can show that I do some terri-bad stuff as well - I am human!! I am going to have to keep my eyes wide open at Winner's from now on!! I would have probably passed it completely!! Lily - Thank you, you're sweet! shortwidenails - Haha, well, thank you! I suppose they weren't the worst things I have ever done! Pumpkin carving is so mean to thee ol' nails! I think we had a grand total of 25 kids, but I handed out about 30 bags of candy, I started to toss extras to kids (when I say 'bags', I mean I make mini baggies - this year they included: a candy necklace, a ring pop, a mini chocolate bar, Hot Tamales and a mini movie time treat) - they seemed happy! I think I have watched 'Hocus Pocus' twice this year. I am going to have to add it to my random old movies to purchase off of Amazon list!! Zara - Thaaaank you! I try.. This year I went with smaller details.. And I didn't screw up (too often..) - I was really pleased with them!! April - Thank you and thank you! I also love Halloween as well.. I have only added to decoration ideas I want for next year, it is like a sickness for me! Super cute! I really have to try doing dots one of these days. 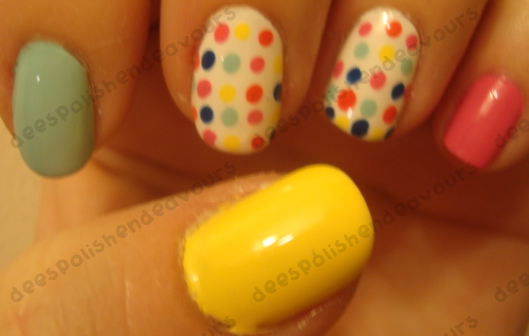 I love these dots! The colors look great together, too!